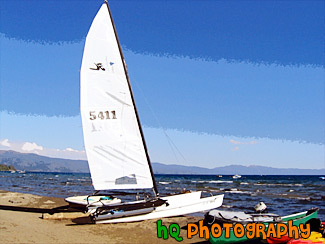 A pretty view at Lake Tahoe of a type of sail boat during July 2004. Lake Tahoe is the second deepest lake in the United States and the tenth deepest in the world, with a maximum depth measured at 1,645 ft (501 m), average depth of 1,000 ft (305 m). The Lake Tahoe Basin was formed by geologic block (normal) faulting about 2 to 3 million years ago. A geologic block fault is a fracture in the Earth's crust causing blocks of land to move up or down. Snow, rain, and streams filled the southern and lowest part of the basin, forming the ancestral Lake Tahoe. Modern Lake Tahoe was shaped and landscaped by the scouring glaciers during the Ice Age. Many streams flow into Lake Tahoe, but the lake is drained only by the Truckee River, which flows northeast through Reno and into Pyramid Lake in Nevada.